Vacation rental townhouse. 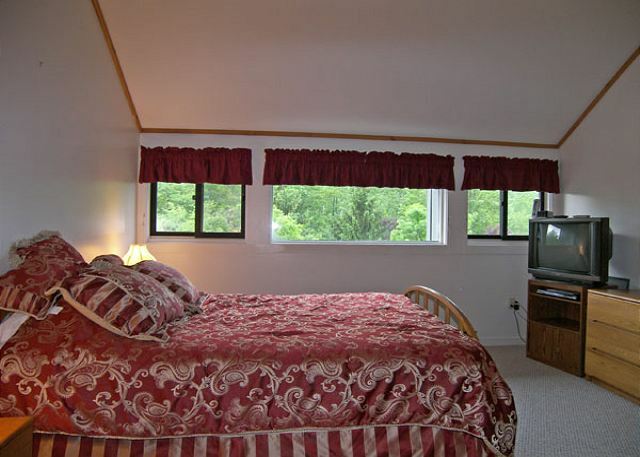 Sleeps 8, 3 bedrooms, 2 bathrooms. No pets allowed. Summer view on a cloudy day. Living room with television and wood burning fireplace. Bedroom with a queen bed and a set of bunk beds. Enter this spacious townhouse in Clearbrook II to the foyer. On level below the foyer you will find two bedrooms, a full bathroom and a small laundry room with washer and dryer. One of the bedrooms on this level has a queen size bed, the second bedroom has a queen size bed, a set of bunk beds and a television. From the entry foyer, head upstairs to the open concept living, dining and kitchen area. 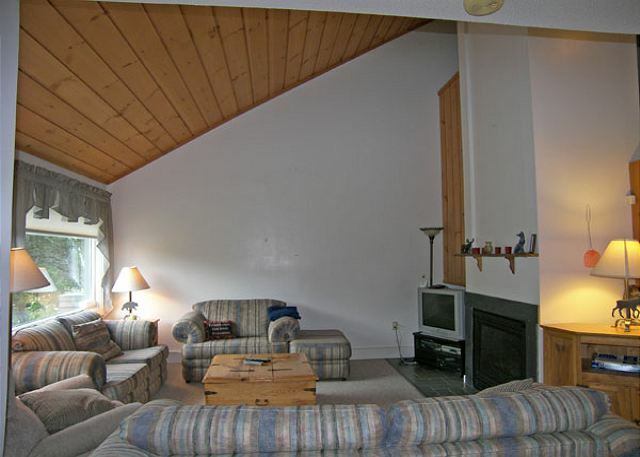 The living room offers a television with DVD and a gas fireplace. The full kitchen has a microwave and dishwasher and plenty of space to create a meal. The dining table has seating for eight. 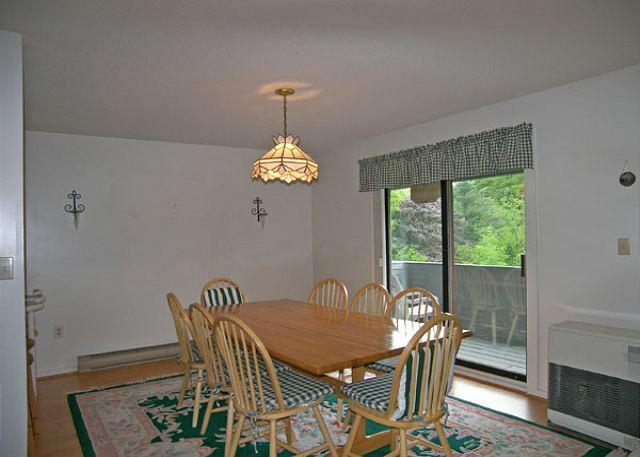 Accessed from the dining area is the deck with mountain views. A few steps up from the living level is the sitting loft with futon sofa and small television and the upper most floor holds the master bedroom suite with queen bed, television and full private bath. Our stay at this rental was overall good. House was clean and had all the basic amenities. Location was close to most of the attraction. I will recommend this if you are looking for affordable getaway. Lovely, spacious town-home by the forest. We enjoyed our vacation at Lincoln-Loon and the property was a big plus. See below for specific ratings. Three less than perfect things: listing should have made clear that the pools, courts etc. 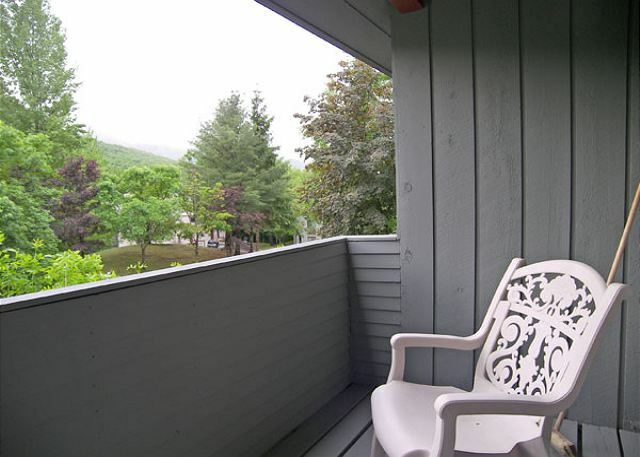 are at an entirely different location way across the main highway, rather than part of Clearbrook; the dining-room chairs need repair; and the landlord forgot to inform Loon Reservation Service of the correct land-line phone number (important because of poor cell-phone service near the forest). The folks at Loon Reservation Service are great! We recommend the White Mountains Attractions Pass if you are staying several days or more. Great place to take your family,great location, great views in the Fall. 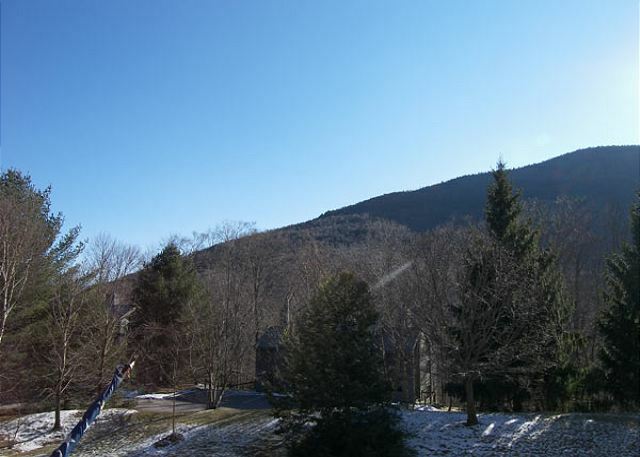 I have never been in the Winter but it must be wonderful place to stay with the view of the Loon mountain. I recommend this place to everyone. The Lincoln area is always a fine spot to enjoy the beauty of the White Mountains. We have rented homes in Clearbrook a number of times over the past years and have found the experience to be comfortable and a good value for an extended stay. This particular unit was nicely situated and in pretty good shape overall. Some minor problems with the stove vents and lights, but this was not a huge problem as the weather was lovely and we could leave windows open. In a hot period, the lack of A/C could be a problem with this unit for a summer rental, but we had weather on the cooler side so things were fine. Wonderful tucked away condo. The only reason I gave the condition of condo four stars is because downstairs bedrooms were musty smelling upon arrival. Also, no fans were available (we did bring our own) and we were having a heatwave of 90o+ weather. These condos are more for ski season in that regard. But condo is lovely tri-level and spacious. My three year old granddaughter enjoyed it here. We're glad that you and the kids had a great stay!